This sophisticated scientific instrument is on display in Jefferson's Cabinet, or study, and it suggests Jefferson's lifelong interest in science, particularly as a means of expanding the range of knowledge and improving the condition of mankind. This and other scientific instruments fill the Cabinet, which was the epicenter of Jefferson's Enlightenment activities. Jefferson's captivation with science was only one aspect of his pursuit of the ideals of the Enlightenment, an eighteenth-century intellectual movement also known as the Age of Reason. Jefferson and other Enlightenment thinkers believed that knowledge was power and that human reason could be applied to improve the condition of mankind. Thomson, Keith. Jefferson's Shadow: The Story of His Science. New Haven, CT: Yale University Press, 2012. Bedini, Silvio A. Thomas Jefferson: Statesman of Science. New York: Macmillan, 1990. 1. Stanton, "Theodolite with Case and Tripod," in Stein, Worlds, 357. 2. Jefferson to Dr. Caspar Wistar, June 10, 1817, Thomas Jefferson Papers, Library of Congress. Polygraph copy available online. 3. 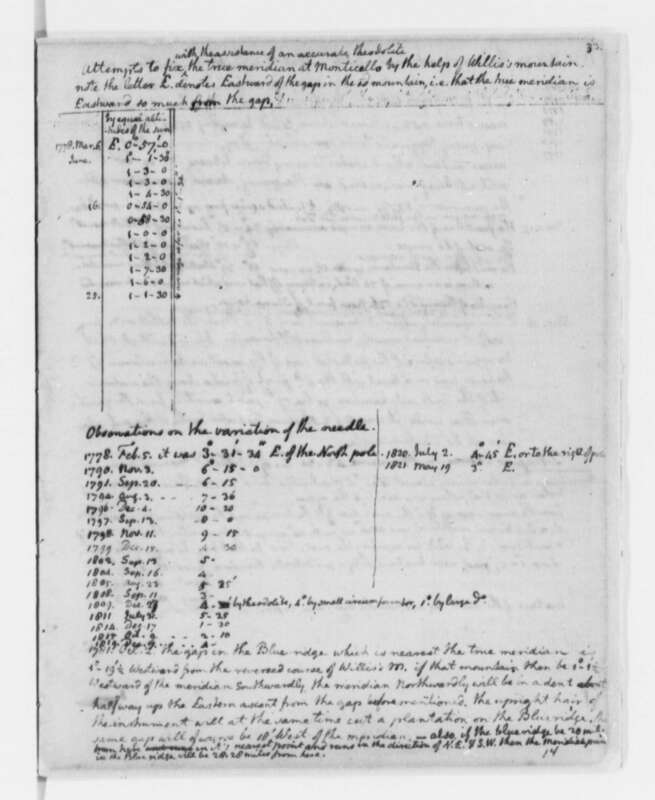 Jefferson, "Mathematical Apparatus," 1783 Catalog, Coolidge Collection of Thomas Jefferson Manuscripts, Massachusetts Historical Society. Transcription available online in Thomas Jefferson's Libraries Project. 4. This instrument was probably made by Jesse Ramsden and is now in the Monticello collection. MB, 1:456. 5. Weather Memorandum Book, 33, Thomas Jefferson Papers, Library of Congress. Manuscript available online. 7. Weather Memorandum Book, 34, Thomas Jefferson Papers, Library of Congress. Manuscript available online. 8. PTJ, 2:202. Transcription available at Founders Online. 9. Betts, Garden Book, 80. 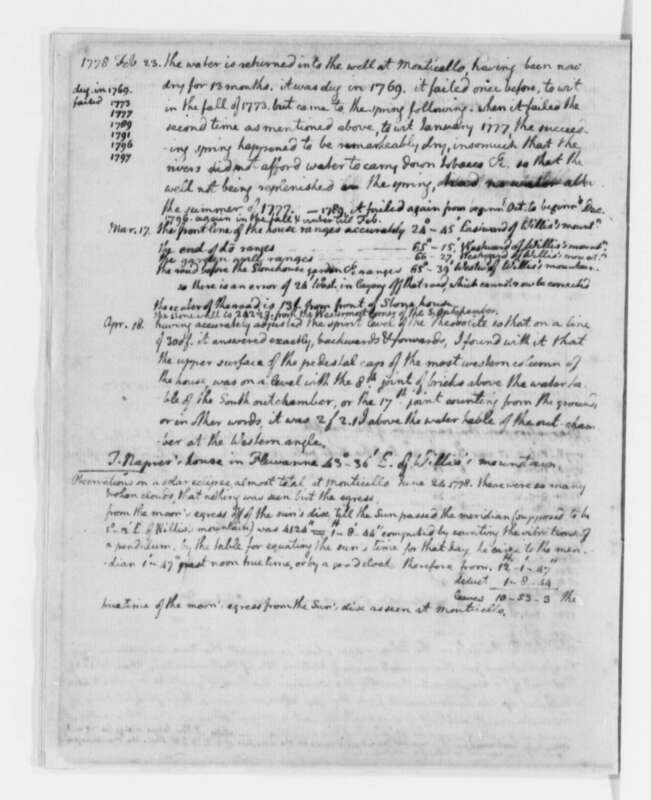 Original manuscript and transcription available online at Thomas Jefferson Papers: An Electronic Archive, Massachusetts Historical Society, 2003. 10. Weather Memorandum Book, 33, Thomas Jefferson Papers, Library of Congress. Manuscript available online. 11. PTJ, 6:348. Transcription available at Founders Online. 12. This device is on the List of Mathematical Apparatus. MB, 1:616. 15. Memorandum of Shipment, Thomas Jefferson Papers, Massachusetts Historical Society. 16. Weather Memorandum Book, 33, Thomas Jefferson Papers, Library of Congress. Manuscript available online. 17. PTJ:RS, 3:479-80. Transcription available at Founders Online. 18. PTJ:RS, 4:369-70. Transcription available at Founders Online.